3/4" or 1" premium nylon sewn with top-quality nylon thread for consistent quality and strength retention. Nickle plated hardware. 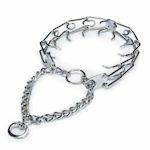 The ring-in-center style allows the collar to roll over which helps prevent the dog from being hung up in fences and brush. Available in an assortment of colors. Herm Sprenger’s Stainless Steel Ultra Plus Training Collar with black finish. The addition of the center plate connector allows the middle link to be configured symmetrically, so they tighten in the same direction. This design improves the effectiveness of the training collar. The black is not painted, it is a chemical process that turns the stainless steel black. These collars are 100% rust proof. Option: You may add a Side Release Buckle to this collar. We have taken a standard, factory new, Herm Sprenger Chrome Plated martingale collar and removed the Ultra-Plus fastener plate and replaced it with an integrated all metal black and chrome side release buckle (quick-snap) held in place using latigo leather and black rivets. If you have difficulty opening and closing objects, our Slide Release Buckle Quick-Snap may be your solution. Instead of opening and closing the individual links of the collar, just unclip the Side Release Buckle and place the collar around your dogs neck and re-clip the Side Release Buckle. You will love the convenience. World renowned as the professionals choice , the HERM SPRENGER line of German Steel ROUNDED TIP martingale design collars. 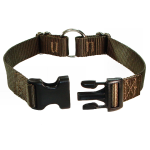 This collar produces an even pressured safe pinch for the most effective corrective dog training collar available. These affordable collars are polished chrome plated steel. Option: You may add a Side Release Buckle to this collar. We have taken a standard, factory new, Herm Sprenger Chrome Plated martingale collar and removed the Ultra-Plus fastener plate and replaced it with an integrated all metal chrome side release buckle (quick-snap) held in place using latigo leather and chrome rivets. If you have difficulty opening and closing objects, our Slide Release Buckle Quick-Snap may be your solution. Instead of opening and closing the individual links of the collar, just unclip the Side Release Buckle and place the collar around your dogs neck and re-clip the Side Release Buckle. You will love the convenience. Quality Herm Springer German made stainless steel plus a Security Buckle Lockable Quick Release. Just slide the red tab on the push button release and the buckle is locked! Guaranteed against rust, tarnish, or breakage when used properly. Proper fit is achieved by adding or removing links -- just snap them in or out. Sizing: When measuring your dog, measure around the neck behind the ears. 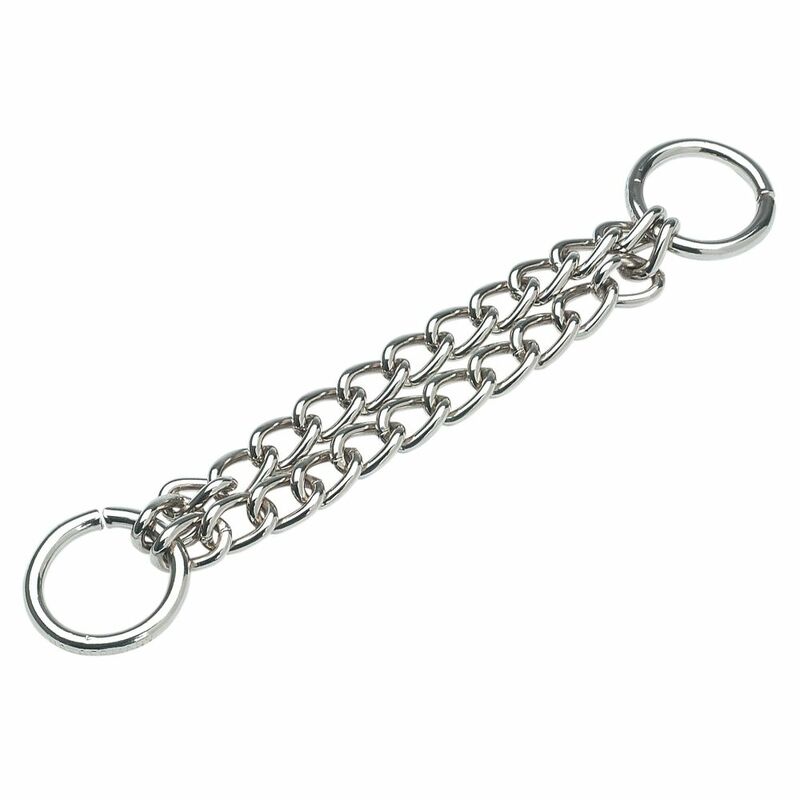 This is NOT a Martingale type training collar. 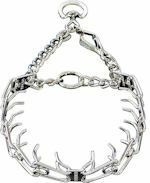 World renowned as the professionals choice , the HERM SPRENGER line of German Steel ROUNDED TIP PINCH martingale design collars. This collar produces an even pressured safe pinch for the most effective corrective dog training collar available. "H" model with the exclusive Herm Sprenger scissor snap is a unique, quick release snap which can be operated using only one hand. it's safe, practical and very easy to use. This collar is made with a scissor snap and not a quick-release or side release buckle. A flat latigo leather buckle (metal quick-snap) collar fitted with nickle plated accessories and a metal quick-snap closure. We incorporated a metal "slide" into this collar to allow you to adjust the size of the collar, just like a typical collar. Each collar is hand cut and assembled.